With over 200 square miles of pristine, mountain-fed waters, Flathead Lake is the largest natural freshwater lake west of the Mississippi. 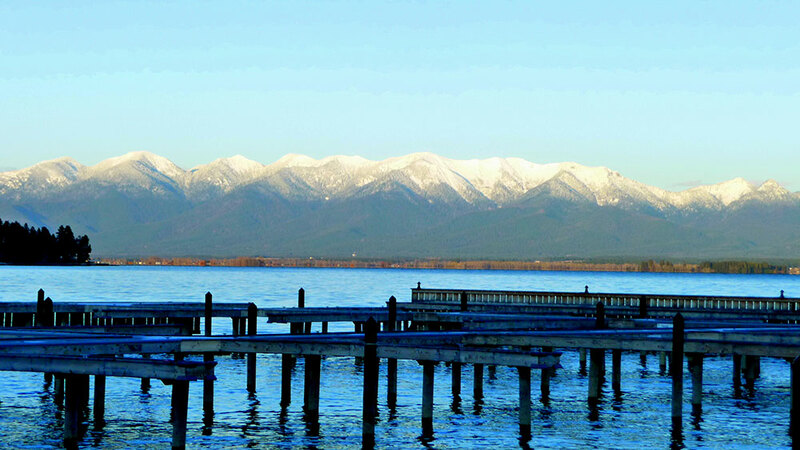 The sweeping snow-capped Mission Mountains rise almost 10,000 feet to the west while the wooded plains of the Flathead Reservation rolls to the East. A quick two-hour drive from Missoula makes this clear-watered lake a road tripper’s dream. The winding, single-lane historic Highway 35 hugging the lake’s eastern shore is riddled with roadside fruit stands selling locally grown and harvested Flathead cherries. On the western shore, Highway 93 is busier and ideal for trucks with trailers, cutting through high vistas and wooded roadways. 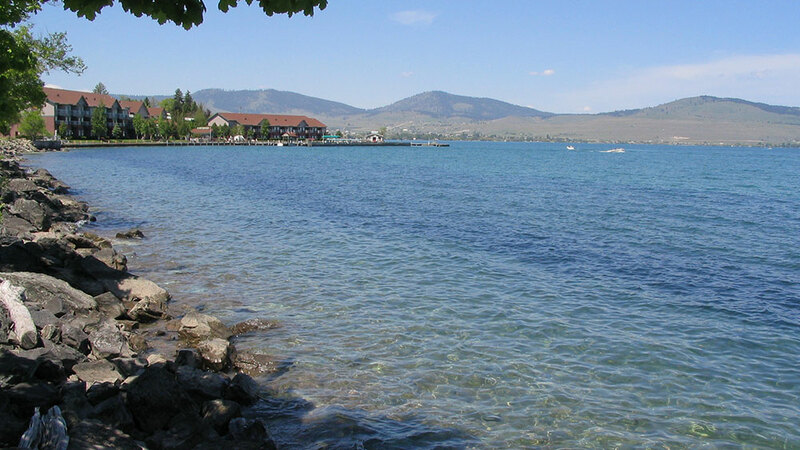 Use this guide of the Flathead Lake region and learn about the neighboring towns that offer great experiences for locals and tourists. If you’re making the trip north from Missoula, the first major town you’ll drive through is Polson. Just before city limits, keep an eye out for the Miracle of America Museum. The non-profit organization houses one of the largest collections of American history and includes thousands of artifacts throughout dozens of buildings around the property. Polson is a true Montana town found at the southern tip of the lake. 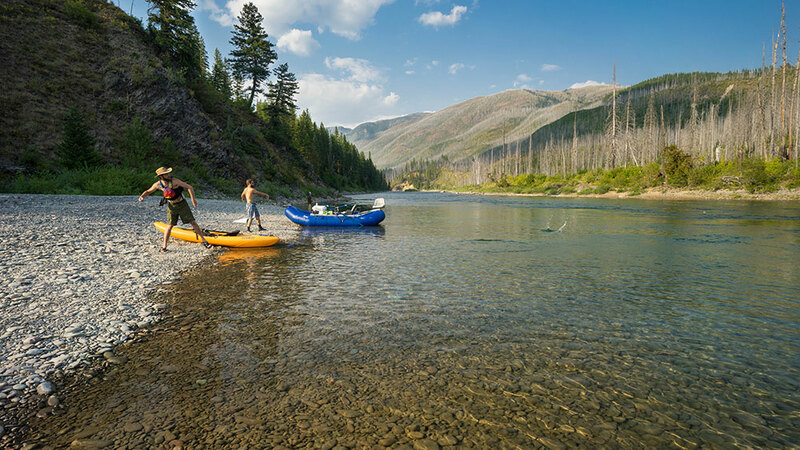 Here, the Flathead River feeds into the lake and is a recreation dream—from whitewater rafting to lakeside sailing. The annual Flathead Cherry Festival takes place every July, and highlights local Flathead Lake Cherry Growers through pit-spitting contests, dishes featuring the Flathead Valley’s produce, and vendors from around the lake. If you find yourself in the area in August, check out Cruisen by the Bay—the largest car show in the Pacific Northwest with more than 500 cars to drool over. A 45-minute drive from Polson through cherry orchards and pebble-strewn beaches will put you in Bigfork. 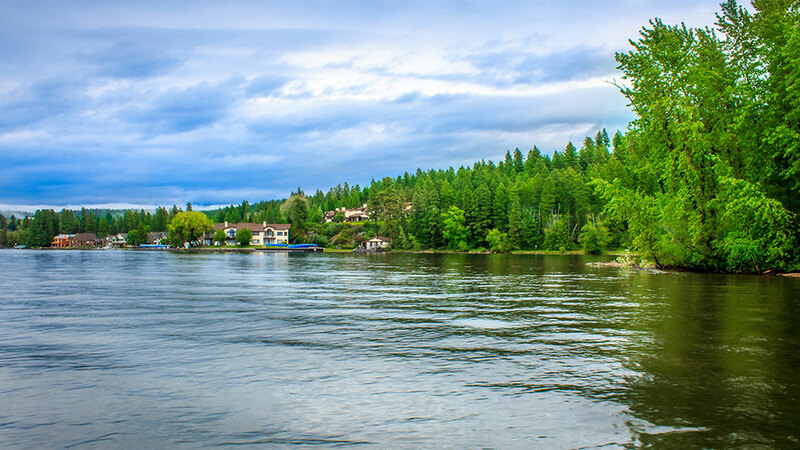 This small artist community is located at the mouth of the Swan River as it feeds into Flathead Lake and is home to the annual Bigfork Whitewater Festival where both professional and recreational whitewater fanatics take to the river to compete. If adrenaline-inducing outdoor sports isn’t your thing then you are in no shortage for alternatives. The Flathead National Forest is at this small town’s doorstep and boasts opportunities for fishing, camping, paddle boarding, horseback riding, hunting, and biking. Bigfork also hosts an annual Festival of the Arts. This special weekend started in 1978 and has grown to 140 booths with more than 6,000 attendees. Every year, the first week of August is dedicated to celebrating local Montana artists and the people that support them. From Bigfork, cut west on Highway 82 until you reach the small community of Somers at the north end of the lake. This small community doesn’t have much in the way of shopping or tourist shops; but does offer a swimming beach, boat launch, yacht club and other fabulous water sports to try out. Next door is the town of Lakeside that offers incredible sweeping views of the Mission Mountains and the eastern shore. Just like in Somers, Lakeside offers a wide-range of water sports, from guided boat tours to paddle board rentals. In the winter time, Blacktail Mountain Ski Area is also available for visitors and locals alike. On your way back to Polson, be sure to stop at M&S Meats in Rollins for their world famous buffalo, beef and elk jerky. This is also a perfect opportunity to stock up on all your Montana gifts, including the state’s well-known huckleberry flavor and homemade sausage. Whatever your pace a road-trip around Flathead Lake is the perfect way to spend a day—or weekend—exploring Big Sky country.